HINT: It doesn’t have to be 30s fabric! The Adventure of creating 99 different, six-inch quilt blocks begins at Quilter’s Fancy. Choose to make your Farmer’s Wife Quilt 1930s Quilt in whichever way you enjoy – machine or hand -- and in whatever colors or fabrics you like! All skill levels are welcome. This is a great class for beginners as well as advanced students at a great value. And of course, we all get together and stitch together and talk and share. “It is great fun to sew different quilt blocks and patterns you have never explored before. I looked forward to every session we had of the first Farmer’s Wife Reproduction Quilt over the 2 years we stitched together at Quilter’s Fancy. And I have 2 great quilts I made and gave as gifts,” said Laura Elsea of Fowler about the last Farmers Wife Quilt Club at Quilters Fancy. Choose the technique you prefer – hand piecing or machine stitching the blocks and sign up for that class. Class One - FW 1930s Hand – A Study in Hand Piecing Dates: 6-9pm Thursdays May 24, June 21, July 26, Aug 9, Sept 20. Teacher Cindy Oravecz will share the needles, the thread, the tricks of being a contented hand piecer. Class Two - FW 1930s Machine – A Study in Machine Piecing will begin June 25 from 6-9 p.m. Anyone interested in the machine piecing version of this class should call the store at 330-637-3106 to register. The first class is $17 plus tax (for fabric to get started, including a free fat 1/8th yard.) After that, the cost is $12 plus tax per session and includes printed handout of each block, a coupon each month for ½ yard of cotton fabric that you choose (you can save your coupon or use it that night), teacher instruction, handout of how-to pointers and periodic surprise give-aways like sample needles, fabric samples, free patterns including our favorite marking pencil. And anytime you sign up for a QF continuing class and attend monthly, you receive 10% discount on all regular priced merchandise (except for kits and beads) anytime as long as you are attending the club. 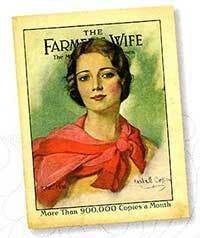 To register for class: purchase the book The Farmer’s Wife 1930s Sampler Quilt at QF. You get your class discount on the book. This quilt is based on 1930s reproduction fabrics also known as feed sack fabrics. During the Depression, women collected the colorful cotton sacks in which sugar, flour and other grains were sold and used them to make clothing and quilts for their families. Each class includes instruction on how to make the blocks and also historic presentations on how these fabrics were used in the past. FREE SIT N SEW will continue as well each month and all our welcome. It will not be called Farmer’s Wife anymore – simply, Free Sit N Sew – and all are welcome to attend. You can bring your quilting, your crocheting, your knitting, embroidery, a snack, whatever you would like to share, even your wandering thoughts on life.